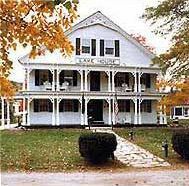 Built in the 1790's, perfectly situated in the famous Lakes Region of Western Maine, LAKE HOUSE is listed on the National Register of Historic Places. Elegant Greek Revival façade with two story high front porches face the tranquil Village Green. 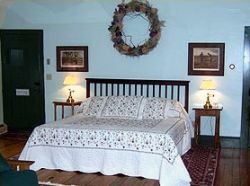 Seven wonderfully restored guestrooms, each with private baths capture the peacefulness of the surroundings. Sumptuous country breakfast prepared by your hosts each morning. The dining room is open for dinner nightly and boasts what many call the "Best food in all of Maine", offering such gourmet delights as Roast Duckling, Gateau Chocolate Chaud, and Duck Liver Pate. Extensive wine inventory. The Inn is open year round. Lake House is available for weddings and small business seminars.